In 1962 Philip Farkas, a noted teacher and former hornist with the Chicago Symphony Orchestra, published a book called The Art of Brass Playing. Subtitled, A Treatise on the Formation and Use of the Brass Player’s Embouchure, this text contained Farkas’s hypothesis on the proper embouchure for a brass instrument. 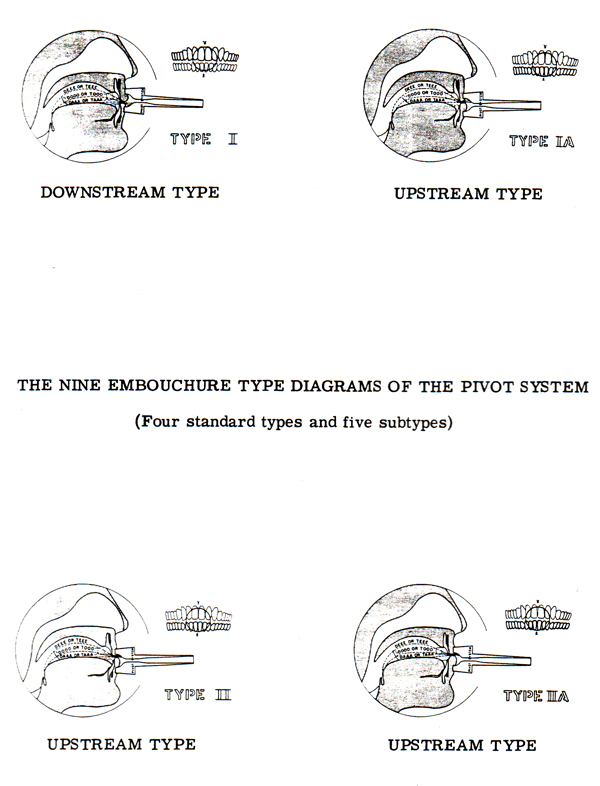 According to Farkas, the proper embouchure would have the lips and jaw lined up in such a way that the air stream would be blown straight down the shank of the mouthpiece, illustrated as below. It wasn’t until later that Farkas tested out this hypothesis and discovered that this wasn’t the case. In 1970 he published a shorter text, titled A Photographic Study of 40 Virtuoso Horn Player’s Embouchures. The photographs Farkas took told a different story from earlier. 39 of the horn players buzzed in such a way that the air stream was directed at a downward angle, and 1 subject blew the air stream upward. Farkas appears to have been unfamiliar with texts on brass playing written by Donald Reinhardt. As early as 1942 Reinhardt had noticed these embouchure characteristics. 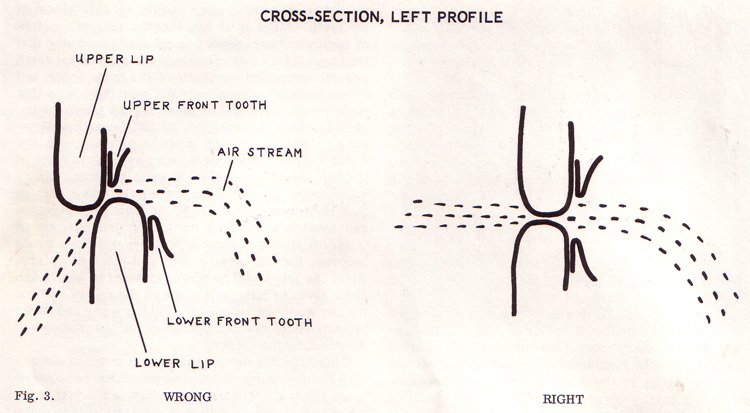 He also determined that it was the ratio of upper to lower lip inside the mouthpiece that made the embouchure upstream or downstream. When the mouthpiece is placed with more upper than lower lip inside the cup the air stream gets blown down. When the mouthpiece is placed with more lower lip the air stream gets blown up. Reinhardt felt that the individual player’s anatomy would be the most important determining factor in which embouchure would work best for a particular player. Sometime in the 1980s Lloyd Leno was doing some research into how the lips vibrated inside the mouthpiece and was surprised to discover that different players would blow the air upstream or downstream. He filmed several well known trombonists using high speed photography. Michael Leno, Dr. Leno’s son, gave me permission to post his film on YouTube, where you can also hear some of Leno’s comments as he screened his film. It’s in three parts. While researching for my dissertation I looked at a number of trombonists’ embouchures and confirmed those findings. 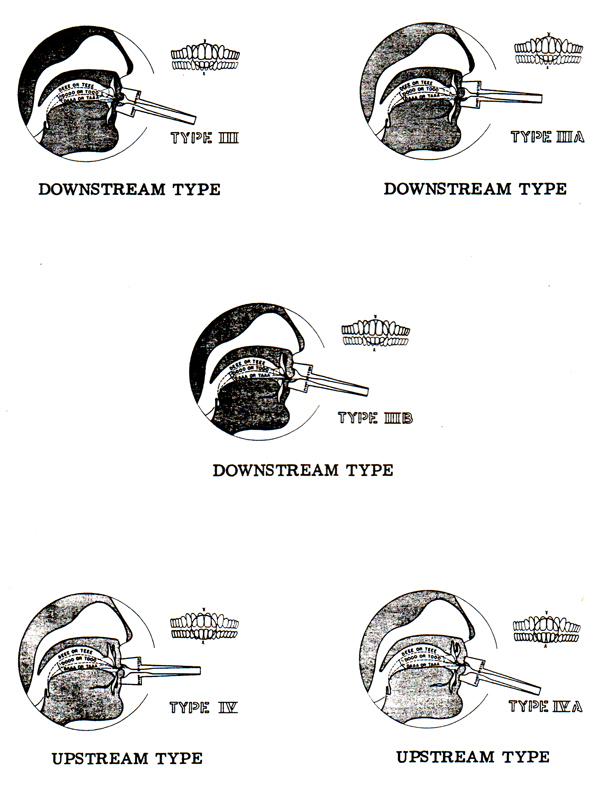 All brass players appear to play with either an upstream or downstream embouchure, and one type is almost always better than the other, depending on the player’s anatomy. Since mouthpiece placement is what determines the player’s air stream direction, and what works best is determined by the player’s physical characteristics, using another player’s mouthpiece placement as a model to follow is usually going to be wrong. It can even cause severe problems down the road, if the player continues to play on an embouchure type not suited for his or her face. Here’s a short video I created to help demonstrate air stream direction on different brass players. All these videos and resources are all just scratching the surface of a complex topic like the embouchure. If you have any questions or criticisms feel free to leave them in the comments section. Check back later for another post about brass embouchures. I finally (after 35 years of trompet playing) understood what is going on my embouchure when I play. Through your research (which is an excellent job) I was able to make some positive adjustments to my embouchure. Thank you very much for you efforts and for sharing your findings in the internet. Question? Is it possible or do you know of someone who plays almost the same when playing both down and up stream? Here is a link to a case study of a tubist who switches between an upstream embouchure and a downstream one. This situation almost always causes problems. While collecting data for my dissertation I did come across a trombonist who was able to play fairly well on both an upstream embouchure and a downstream one, but the downstream one was much better for him. One embouchure type will work best, depending on the player’s anatomy, and I advise brass players to use one embouchure for their entire range, rather than switch between types. Hello Dave. A most enjoyable and informative site. You have put in an enormous amount of work in presenting lots of facinating information! I have been typed as having 3b chops (I am a trombonist) and have benefitted from several Skype lessons with Richard Willey. One subject I have been unable to get a clear answer on is this: As a 3b, what should I be good at (eg, good sound) and what will need extra effort because of my downstream type? The reason I ask this is because it would be helpful not to beat myself up over certain areas of my playing if, in fact, it is an area that needs extra study because of my physical make up!! Thanks for stopping by! I hope you’ve found some materials helpful. Everyone is different, so it’s hard to say without watching you play what you should be working on. That said, most IIIBs (or, as I prefer to call them, Medium High Placement embouchure types) tend to have an easy time getting big, dark sound and often have an easier time developing lip flexibility. Medium High Placement players sometimes don’t play with their embouchure formation firmed up enough, particularly in the lower register, and struggle with their upper register because of it. There’s a little more I can comment on, but don’t have the time just now. It probably deserves a post of its own anyway. I’m a trumpet player of 8 years now, currently pursuing my Bachelor’s in Music Ed. These past couple months I’ve gone through a lot of playing, and my professor is now pointing out to me that I curl out my bottom lip too much when I play, and so the buzz is forming in the red of my bottom lip. Over the past weeks I’ve been trying to curve my lip in, but to seemingly no avail. Any tips? I’d have to see what you’re doing. Can you post video? From what you describe it might not even be a problem. Hard to say. By now, I’ve read your articles and watched your clips several times, and they have been most helpful an illuminating. Thanks so much for all your effort in analysing and explaining a complex and contentious subject. As I understand it, according to your explanations, both downstream and upstream players aim the airtstrem towards the center of the mouthpiece (i.e. the shank( for the low notes, and then change the angle up or down towards the rim of the mouthpiece as they ascend in pitch. Being a downstream player, when I consciously controlled the airstream direction as described, it did seem to work. I’ve also watched this clip many times. It seems to be quite clear that this player is doing the opposite with his airstream direction. He is clearly playing the lower notes with the airstream aimed downwards towards the rim of the mouthpiece, and then moves towards the shank/center as he ascends the register. Oddly, I also tried this way of playing and it also works quite nicely. So I’m kind of confused as to which way to go in my own embochure. Could you kindly review the X ray clip in question and clarify what is happening there. The player would seem to be a downstream players, like most of us are, but his airstream direction seems to be opposite of what has been stated in yours and the Reinhart studies. Many thanks! I’ve seen and blogged about another video from the same study here. It seems to be quite clear that this player is doing the opposite with his airstream direction. He is clearly playing the lower notes with the airstream aimed downwards towards the rim of the mouthpiece, and then moves towards the shank/center as he ascends the register. I’m not completely certain what it is you’re seeing that makes you think this, but I suspect that you’re seeing this player’s embouchure motion of pulling down to ascend/up to descend and confusing that with the direction of the air stream. It’s really not possible to see what’s going on with this player’s air stream with this x-ray video, it’s much clearer to see the position of the lips inside the mouthpiece with normal video and a transparent mouthpiece. I’m guessing that this trumpet player is the “medium high placement” embouchure type based on what I can gather with the x-ray, but it’s possible that he could be the “low placement” type. 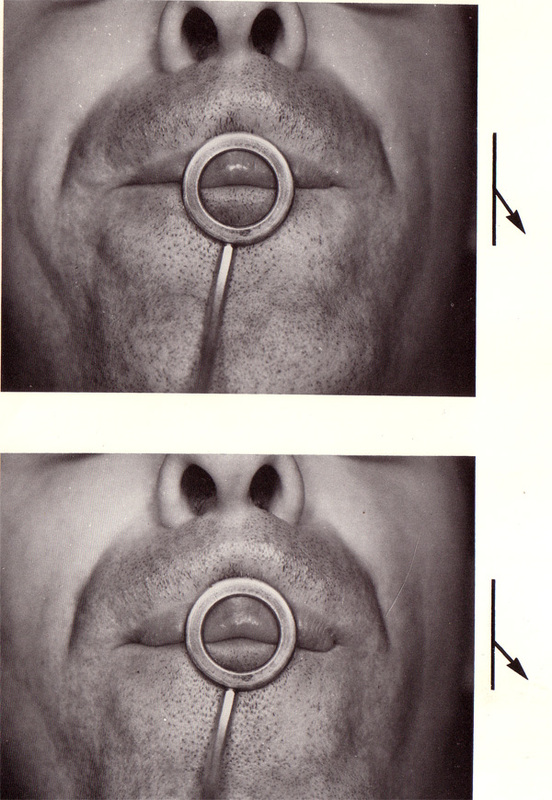 Both use the same embouchure motion, but one is downstream and one is upstream. Hard to to say without being able to see the soft tissue of the lips that don’t get seen in this x-ray. Thanks for sending this link along, I haven’t seen this particular one before. Hi Dave, What is the best way to determine which air direction is the best for me? That’s a little tough if you don’t have some experience seeing what the different embouchure types look like when they work and when they don’t work. For example, a player who should be playing upstream but is playing downstream will not be able to direct the air stream further downstream to ascend if you watch in a transparent mouthpiece. 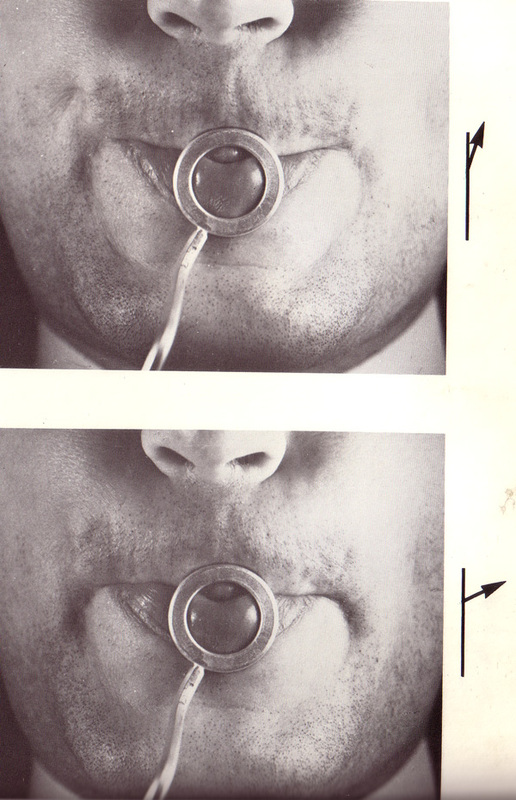 Over time, an observant teacher can learn to spot the signs without using a transparent mouthpiece. Often a little guided trial and error is necessary. Can you take video of your playing? If so, check out what I like to see on video and maybe I can spot something helpful. Thank you very much for your research for me they are being revealing. I am a tuba teacher and their website and their videos are a resource that I use a lot. Do you know of any scientific study on whether one of the two lips predominates as an engine and the other as recessive? I have several videos recorded with a lipcam and I can not determine if the lips always clash with each other even in the legato. Would you explain to me if it is like that? I’m not sure what you mean by one lip workin as an “engine” and the other as “recessive,” but look into research about brass embouchures and air stream direction. The lip that is predominant inside the mouthpiece will vibrate with greater intensity. Watch Lloyd Leno’s film that I included in the above post.